It’s contract bargaining time again for Seattle Public School teachers and one important aspect on the table this year is class size. The district wants to increase class sizes, not for budgetary reasons, but as they put it, due to issues of “capacity”. I have to smile to myself about this because just a few years ago, there was a big push by our former Broad superintendent and her school board contingent to close schools. A costly and pointless exercise that created an even greater demand for classroom space the following year. Bill Gates and other ed reformers have said repeatedly that class size doesn’t matter and yet they send their children to private schools where classes are intentionally smaller to allow for more individual attention. Class size doesn’t matter for the rest of us, or even more pointedly, for minority students who are the target of corporate reform. 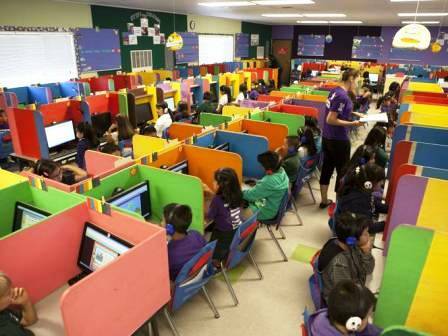 Many private enterprises selling online learning products and services such as Rocketship and K12, Inc. repeat this mantra to sell the idea that a district can put 50 children in front of computers and only require one teacher. What a deal. Common sense would say that it’s better to have fewer students in a classroom than more. It provides more opportunity for each student to participate, for every student to receive individual attention as necessary and provide greater opportunity for discussion and sharing of ideas. There are also studies that support the obvious and are referred to in the following position paper created by Leonie Haimson, Parents Across America founder and editor of Class Size Matters. This Wednesday, August 14th, the Seattle Education Association will be having a press conference at Franklin High School at 3:30 PM to discuss their views on class size. Students, parents and concerned advocates are invited to attend. Across the United States, class sizes are increasing at unprecedented rates. An estimated 58,000 teachers were laid off in September, at the same time as enrollment was increasing in much of the country. Clearly budget pressures are weighing on states and school districts, but there has also been a fierce attack on the value of class size reduction. 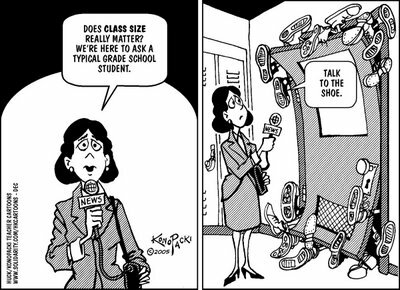 So perhaps it is time to review what the research really says and what experience shows about the importance of reducing class size. 1. Fact: Class size is a proven and effective reform. 2. Fact: There is NO threshold that has to be reached before class size reduction provides benefits. 3. Fact: Large scale programs such as class size reduction in California did indeed work. Every controlled study of the California class size reduction program — and there have been at least six so far — have shown significant gains from smaller classes. Unlike the STAR studies, nearly all elementary schools in the state reduced class size at once — especially in grades K-2nd — so it was hard to find a control group with which to compare outcomes. Also, the state exam was new, making it difficult to compare achievement gains to past trends. In the five largest school districts other than Los Angeles, namely San Diego, San Francisco, Long Beach, Oakland and Fresno, researchers found that class size reduction raised the proportion of third graders who exceeded the national median by 10.5 percent in math, and 8.4 percent in reading, after controlling for all other factors. Even larger gains occurred in schools with high numbers of poor students, and in schools that had 100 percent black enrollment, lowering class size resulted in 14.7 percent more students exceeding the national median in math, and 18.4 percent more in reading. Another study found substantial gains in California student scores on the National Assessment of Educational Progress assessments, due to class size reduction. 4. Fact: Class size reduction does not lower the quality of teachers. Though anecdotal reports in California said teachers from disadvantaged schools fled when new positions opened up in other schools when class sizes were reduced , what the follow-up studies show is that after rising temporarily in all schools, teacher migration rates fell dramatically to much lower levels than before, most sharply in schools with large numbers of poor students. In fact, for the first time, teacher migration rates began to converge in all schools, rich and poor. This finding is not altogether surprising, since teachers in high-poverty schools had better working conditions and a real chance to succeed, their incentive to flee elsewhere was substantially alleviated. Indeed, other studies have confirmed that when class sizes are lowered, teacher turnover rates fall. This phenomenon would be expected to act synergistically to enhance teacher quality over time, as lower rates of attrition particularly would tend to increase the experience level and overall effectiveness of the teaching force, especially in large urban districts, and save funds on teacher training at the same time . 5. Class size matters, not only in the early grades but at all age levels. Although there have been no large scale experimental studies done for the middle and upper grades, there are numerous studies showing that smaller classes are correlated with achievement gains and/or lower dropout rates in the middle and upper grades as well. One comprehensive report, done for the United States Department of Education, analyzed the achievement levels of students in 2,561 schools across the country. After controlling for student background, the only objective factor found to be positively correlated with student performance was smaller classes, not school size or teacher qualifications, nor any other variable that the researchers could identify. Moreover, student achievement was even more strongly linked to class size reduction in the upper grades than the lower grades. Two recent studies that show that class size matters, even in college. One from the University of Richmond concluded that increasing class size to 30 students to 45 had a negative impact on the amount of critical and analytical thinking required in business classes, on the clarity of presentations, the effectiveness of teaching methods, the instructor’s ability to keep students interested, and the timeliness of feedback, among many other key factors of educational quality. Our baseline results suggest that increasing class size by 20 students reduces a student’s wage by approximately 6 percent. Given this estimate, it would be hard to dismiss class size reduction as an ineffective and inefficient policy. 6. Fact: Class size reduction narrows the achievement gap. Though many of the corporate-style reformers argue that their preferred priorities of more high-stakes testing, the elimination of teacher tenure, and expansion of charter schools will narrow the achievement gap, there is no evidence to indicate that these policies will work, and in fact, recent evidence suggests that such policies will further cause high-quality teachers to flee from our neediest schools. Instead, researchers such as David Grissmer of RAND have found that the reductions in class size that took place nationally in the 1970s and 1980s might account for part or most of the substantial test score gains among poor and minority students — and the narrowing of the achievement gap that took place over the this period. Why? Students from disadvantaged groups experience two to three times the average gains from smaller classes than middle class white students. Many of the most celebrated charter schools that the corporate reformers celebrate cap class sizes at 18 or less, such as the high-performing Icahn charter schools in the Bronx and the Harlem Children’s Zone. Meanwhile, class sizes in our inner-city public schools continue to grow larger each year. As a recent issue brief on the achievement gap from the Educational Testing Service points out, schools having high numbers of minority students tend to have larger classes of 25 students or more, and the class size gap between high-minority schools and low-minority schools actually worsened between 2000-2004. Don’t we have a moral obligation to provide equitable opportunities to all children, especially when we know that class size reduction especially benefits those who need this help most? 7. Fact: Class size reduction is cost-effective. Many studies have shown that class size reduction yields numerous benefits that outweigh the cost. Alan Krueger of Princeton has found that the estimated payoff in terms of increased earnings is twice as high as the costs. One re-analysis of the STAR data published in the American Journal of Public Health estimated that reducing class sizes is one of the most cost-effective public health measures society can take, with large savings in health care and almost two years of additional life for those students who were in smaller classes in the early grades. Moreover, it is possible to reduce class size without spending any more money, by redeploying out-of-classroom staff. See this study, for example, by Christopher Tienken and Charles Achilles, showing how a middle school in New Jersey managed to reduce class size and dramatically lower student failure rates at no extra cost. If there are only a few reforms we know have substantial benefits to children, and improve their education, health, and life outcomes, why not invest in these reforms, rather than waste billions of dollars on unproven policies with possibly damaging consequences, including the rapid expansion of charter schools, more high-stakes testing, and teacher performance pay, as promoted by Race to the Top and other federal programs? Many of the individuals who are driving education policy in this country, including New York City Mayor Michael Bloomberg, Jeb Bush and Bill Gates, sent their own children to abundantly financed private schools where class sizes were 16 or less, and yet continue to insist that resources, equitable funding, and class size don’t matter — when all the evidence points to the contrary. I will leave you with this video of Los Angeles School Board Director Steve Zimmer’s remarks about class size. Anyone who thinks adequate funding of education doesn’t matter, think again. There is an indirect correlation between education funding and class size. Where are the links to the research mentioned? For some reason, the links didn’t pick up in my post. For the original posting with the links intact, go to http://parentsacrossamerica.org/what-we-believe-2/why-class-size-matters/. For additional research, go to http://www.classsizematters.org/research-and-links/.